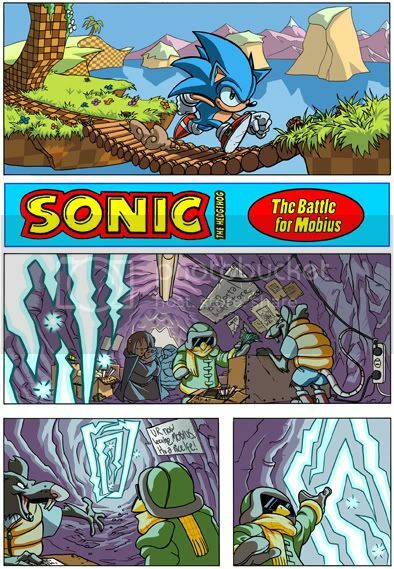 Sonic The Comic- Online, the webcomic I've been involved with for the last 8 years has reached issue 250! 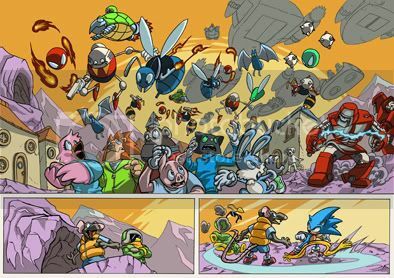 It is a fan-continuation of Egmont Fleetway's British Sonic the Hedgehog comic and admittedly continues the numbering from the original series, still, it feels like a colossal accomplishment of organisation and dedication from the creators and staff who've worked on it over the years to have taken it this far. Issue 250 will be my last issue as a strip artist for the forseeable future, although I will still be contributing covers occasionally. I just wanted to shout out to Mike Corker, Ed Reynolds, Tom Huxley and Charles Ellis for their key roles, respectively, in setting the project up and keeping it running. This issue breaks tradition and has the majority of the artists and writers who've worked on the comic all collaborating on an extra long story and it's been a real labour of love. I wish everybody involved the best of luck for the future! Here are my 3 pages, 2 & 3 are a double page spread by the way. Click here to read the whole thing and be sure to check out the back issues if you like what you see! Your pages were fantastic man!